“Higher education in Kenya is marred with a lot of challenges. 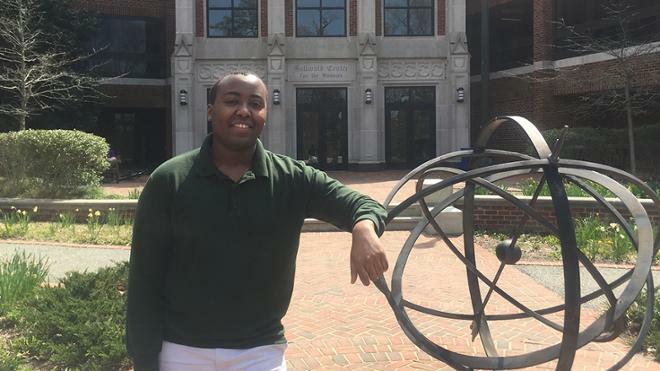 I was thrilled when I got accepted at the University of Richmond, and knew I would thrive here,” Kitimet said. Recognizing the important role books play in learning, he wanted to do something and give back to his community. He recently received a $10,000 Projects for Peace grant to support starting the first library in Kiserian, his hometown. Kitimet will travel to Kenya this summer to help establish the library, which will provide 600 elementary and middle school students with increased access to books and other learning materials. “Kiserian students are negatively impacted by inadequate school funding, few qualified teachers, out-of-date textbooks and a high student-to-textbook ratio,” Kitimet explains. By providing well-designed and updated textbooks in the new library, he hopes to improve learning outcomes and better prepare students for the future. "I hope to give Kiserian students access to knowledge that will encourage better understanding between them and other people of different origins and opinions,” Kitimet said. “Access to learning will build their capacity to be a positive force for equality of opportunity, personal development and economic advancement, which are all factors I believe are preconditions for peace." Kitimet is majoring in mathematics with a minor in economics. He is actively involved in the Richmond community through the Bonner Scholar and Oliver Hill Scholar programs. Davis Projects for Peace is an initiative begun by philanthropist Kathryn W. Davis. Each year, students at American colleges across the country submit proposals for grassroots projects that are designed to build peace. The projects deemed most promising and feasible are awarded a $10,000 grant.